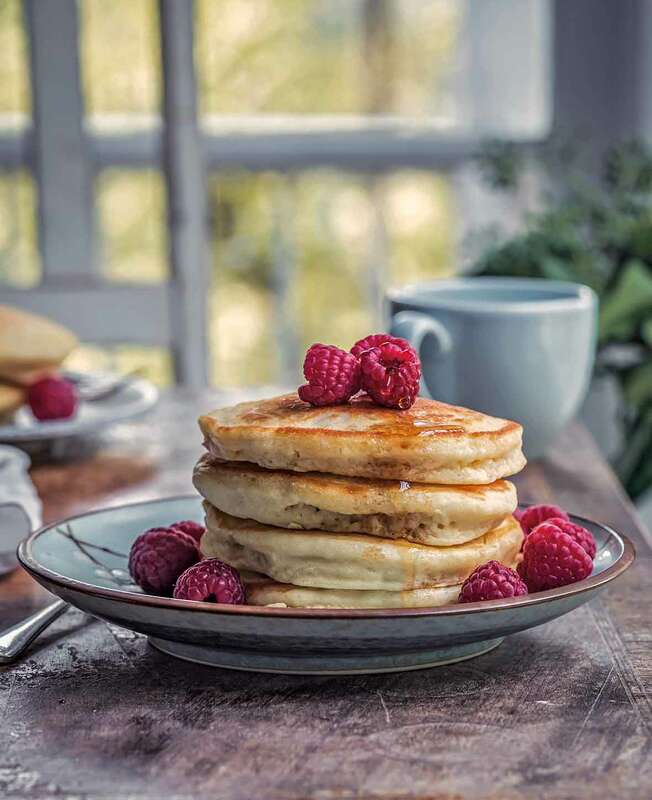 These vegan pancakes, made with pantry staples of dairy-free milk, coconut oil, flour, sugar, vanilla, and baking powder, are easy to make and the finished pancakes are extraordinarily fluffy. Perfect for all the pancake eaters at your table. This recipe relies on the astounding—and seemingly mystical—ability of baking powder to elevate even the densest of batters into something light and airy and fluffy. But here’s the trick. The effectiveness of baking powder diminishes over time. Translation? If your baking powder isn’t fresh, you’ll be left with exceptionally flat and overly dense pancakes through no fault of the recipe. How long is too long to keep an open tin of baking powder? Baking powder is purported to retain its usefulness as long as 12 to 18 months after it’s opened. If you can’t recall when you got your current container, it may be worth testing it prior to jeopardizing your time and other ingredients. To see if it’s still viable, simply stir about a teaspoon of baking powder in about 1/2 cup very hot water. If no fizzing or bubbles or other antics take place, your baking powder is a dud. Toss it and replace it. 1. In a large bowl, stir together the flour, sugar, salt, and baking powder. In a separate bowl, whisk together the dairy-free milk, melted coconut oil, and vanilla. Add the liquid mixture to the dry ingredients and stir just until combined. Lumps are fine. Set the mixture aside at room temperature until the batter thickens and becomes a little airy, 5 to 7 minutes. This resting time is essential as it allows the baking powder to do its magic (see note above) to make fluffy pancakes. 2. Preheat the oven to 200°F (95°C). 3. Set a well-seasoned cast-iron skillet (or, if you don’t have one, a non-stick skillet) over medium heat and add a smidgen of coconut oil to melt. When the oil is just bubbling, add a small ladle of batter to the pan and cook gently until bubbles appear on the surface and the edges begin to crisp, 2 to 3 minutes. Flip the pancake and cook on the other side until cooked through, about 1 minute more. Repeat with remaining batter, keeping the cooked pancakes warm in the oven. You probably won’t need to add additional oil to the pan. 4. If desired, serve with maple syrup and fresh fruit. *You can easily make your own self-rising flour. Simply stir together 1 1/2 cups all-purpose flour and 2 1/4 teaspoons baking powder. If you’re using this nifty equation for another recipe, add 3/4 teaspoon table salt. If you’re using it for these pancakes, rest assured, there’s sufficient salt in the recipe so that you don’t need to add any here. 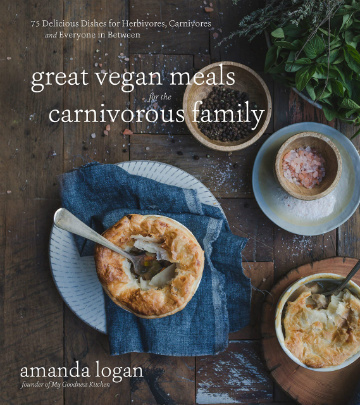 Vegan Pancakes Recipe © 2018 Amanda Logan. Photo © 2018 Amanda Logan. All rights reserved. All recipes and photos used with permission of the publisher. Wow! Hard to believe these pancakes don't have eggs in them. These were super easy to make and even as an omnivore I would happily make these again just because they were so good. I used pea protein milk but for non-vegans I'm sure cow milk would work just fine, too. It’s important to check the ingredients of your self-rising flour for salt and omit as needed and make sure you're not using old baking powder. Letting the batter rest is also crucial. I made these twice and the first time they did not fluff up very much but were still pretty delicious. I tried again but this time omitted the salt as directed and used fresher baking powder and that made all the difference. These pancakes are the fluffiest pancakes my kids and I have ever eaten! We loved the slight coconut flavor that the unrefined virgin coconut oil imparts. I even put some coconut oil on the griddle before cooking the pancakes, which further boosted the flavor. Next time, I think I’ll try the recipe with white whole wheat flour. It will up the fiber and add a nutty flavor but still keep things light and fluffy as opposed to plain wheat flour. Then I will not feel so guilty when my kids and I split the entire batch! Of course, if you’re looking for the ultimate fluffy pancake, use self-rising white flour. I used light brown sugar as the sweetener, made my own self-rising flour, and used unsweetened vanilla almond milk. Like many people, I am always after a good pancake recipe—vegan or not. I was totally surprised at how well these turned out. They were very fluffy and tasted very good. In fact, my picky husband and my 11 month old both enjoyed them! To me, that was the biggest win. This may be THE pancake recipe we use from now on. I had pancakes for brunch and now just finished leftovers for dinner. My pancakes looked just as beautiful as the accompanying photo! I skipped the warming oven and served the pancakes from pan to plate, so everyone got, literally, hot cakes! I also warmed the maple syrup and had extra butter available, which melted beautifully atop the just out of the pan pancakes. It's winter in the Midwest, and fresh fruit isn't at its finest, so I used a can of peaches I purchased at a farmers market this summer in lieu of the fresh fruit and they were perfect atop these pancakes! Alternately, a compote or a jam would be lovely and more flavorful than the berries available fresh right now. Some trail mix, especially one with dried fruit, would add texture and also pair well with the maple syrup. I also would love to bite into these and have blueberries or raspberries bursting from them. Frozen berries would work just fine as an addition to the batter, as would any kind of nut. And now to backtrack to making the pancakes. I started by making my own self-rising flour. If given the opportunity, I'll pretty much always go the DIY route. I used Oatly's Barista Edition plant-based milk. It's great that lumps are fine, since I had plenty of them. I let the batter sit for the full 7 minutes and, at the end of the time, I had a very thick and airy batter. It was so thick and airy that I wasn't sure how it would behave in the hot pan, but it spread to a circle and cooked up precisely according to the stated timings. For the first pancake I followed the direction to butter, add batter, cook, flip and finish cooking. For subsequent pancakes I buttered before flipping over, which gave a crisper finish to the flip side. I'm not a big believer in nonstick pans, and I used a well-seasoned cast iron. These would be really terrific with this Blueberry Syrup! I agree, Elsa. Wouldn’t this be perfect for a Sunday brunch?